The toe bone is connected to the foot bone…..the esophagus is connected to the ? This week I have two interesting things to discuss so I am going to split it into two separate blogs. This blog will focus on a questions prompted by a few of my co-workers this week as well as Steve’s blog “I still have a torso“. What exactly is the surgery that you are having? I realize this week that I speak a lot about “the surgery” but not exactly what “the surgery” involves. So today I’ll give a brief overview of what I will be having performed. It is called a Total Gastrectomy with a Roux-en-y esophagojejunostomy (try saying that ten times fast!). From my understanding, it is a fairly involved surgery that can take approximately 4-5 hours once you are in the operating room. Just like an airline flight, I will need to arrive a the hospital three hours before surgical time, only this flight has no return ticket. I’m not exactly sure what occurs in those three hours prior to surgery but I am sure they involve the preparation. I bet it also ensures that people will make it to their surgery on time given the state of the traffic on Ontario’s major highways. I know that I will be having more IV’s as well as an epidural (similar to what women can receive during labour) only this epidural will remain in me for some days after surgery to help manage pain. The surgery is similar to gastric bypass surgery. I think the difference is that the lymph nodes surrounding the stomach will also be examined and removed to prevent any chance of cancer going to other places of the body. I am unsure if the surgeon will do a D1 or a D2 Lymphadenectomy. This is also important because until this point, I will not know if my lymph nodes have been affected or not (meaning chemo and/or radiation afterwards). But not to scare anyone, so far, my surgeon has not had any patients with Hereditary Diffuse Gastric Cancer syndrome who have needed chemo and/or radiation *knock on wood*. After the surgery, I will likely be in the hospital for 8-9 days. 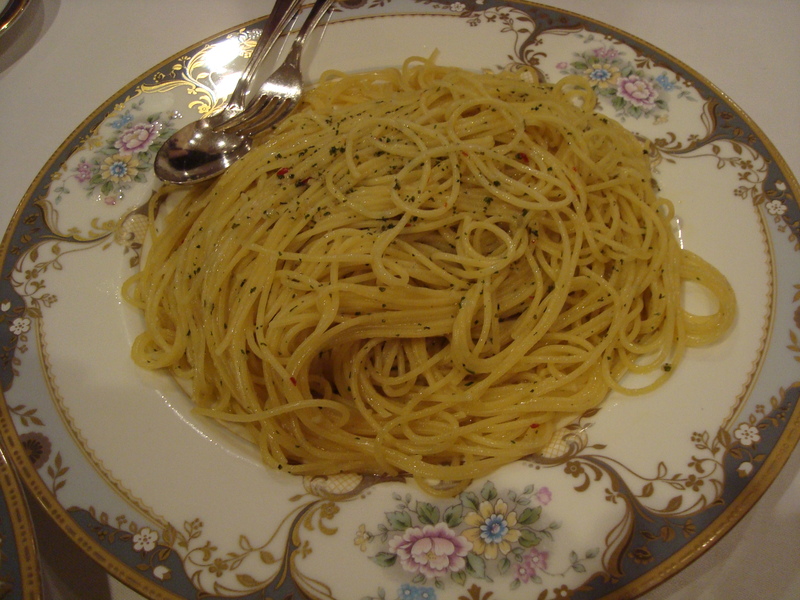 For the first 4-5 days, I will not be able to eat or drink anything to ensure that everything is connected and healing well and prevent leakage. So for those who are planning to visit me, bringing delicious snacks is probably not a good idea during those days….haha. 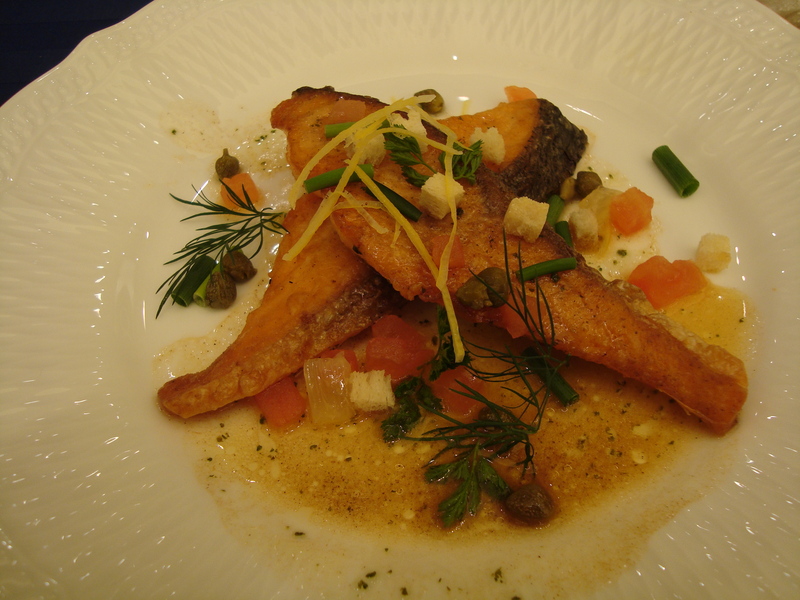 In terms of nutrition afterwards, I will have to eat small frequent meals. From reading other people’s blogs and watching my mom go through it, I believe the first month is the hardest and things get easier from there. I think this is because your body is initially like, “What the?!? !” and then it’s like, “Oh, I got this”. The body is an amazing machine. I’m also going to gain 100lbs – Just kidding, if only it was going to be that easy! I will likely lose 20% of my body weight over the next six months before it evens out. I will no longer be able to eat copious amounts of sugar but that’s okay because you probably shouldn’t eat that way anyways. I will have to watch my vitamin levels and I will also need to have regular B12 injections. I also will not feel hungry ever again which will be a new concept and I hope that will mean I no longer get, “Hangry” (hunger = angry). In terms of work, I will be taking about two months off. Because the job is fairly physical, I want to be sure that I’m fully recovered before jumping back into things. This will be a difficult thing for me because those of you who know me, know that I love my job. I am thinking that during the second month, I’ll start physiotherapy at one of our clinics because I will have stayed in the hospital over night, so I will be covered by OHIP. Yes! *Shout out to all our OHIP funded clinic teams*. So that’s about it in a nutshell. For more information, I encourage you to check out no stomach for cancer’s webpage link regarding the surgery and more. Yesterday I woke up with a fever, and feeling like I had been hit by a Mac truck. I thought my cold was getting better but it seemed to have turned into the plague overnight. Every time I opened my eyes, it was as if someone had punched me in the face. I spent all of yesterday sleeping on the couch. I’m not sure if this was already coming for me or if the stress of what happened during the week made it worse, but it happened. Brandon spent his whole day cleaning the house, making me food, bringing me water, and helping me be comfortable. When I finally woke up for more than five minutes, I was blown away by the amount of work completed throughout the day. I’m so glad that I did not go in for surgery on Thursday if this was what was going to happen to me on the Friday. I am super lucky that everything was moved. Also, lying on the couch all day with Brandon doing all the work was like a preview of how life is going to be like immediately following hospital discharge. The reason why the surgery was moved definitely became clear. Today I feel 99.9% better. Sickness destroyed. Easter stomach ready. Let’s do this!! 3.5 Weeks and counting to ONE DAY and counting to ?? In the last 24 hours I have experienced a variety of emotions. It all began with an email and voicemail that I received at 5:30pm last night. It was from the surgeon’s clinical assistant notifying me that there had been a change in the operating room schedule and my May 12 day was no longer available. As of now, there was no other time in May to reschedule me at this point. That being said, there was an availability in the operating room for tomorrow. She wanted to let me know that the surgeon would be calling me later that night to discuss if I my availability as I was given first refusal. I immediately went into preparation mode calling my husband as well as my parents to notify them of the news and also to discuss the course of action. I wanted to call them ASAP and beat my surgeon so I could give her an answer right when she called me. Me being a git’r done sort of person, I decided that no better time but the present. I also called my boss to let her know what was happening. The only thing that was affecting my decision was that I am still jet lagged from the trip and fighting a minor cold. The hours between 5:30pm and 9:00pm were extremely stressful. Brandon had to make all the appropriate calls to his work place to arrange his work schedule for today as he was originally scheduled to work. He wanted to have the day off so we could spend time with each other to get things done before the surgery. I put my parents on standby because they are accompanying me (along with Brandon of course!) during the surgery. They then put their Easter plans on hold. I called work and asked for the day off because I also wanted to get a few things sorted out. I didn’t have time to even think about the surgery. Last night my cell signal was very bad and was putting my calls straight to voice mail between the hours of 7-9:00pm. I did not realize this until 8:30pm which lead to a little bit of a melt down. When I picked up my phone to check to see if anyone had called, four people had called and one of those messages were not saved because apparently my voice mail box only holds three messages. I was really worried that the fourth phone call was the surgeon. I frantically searched Google and miraculously found her work email (thanks Google!). I was able to email her and provide a different phone number in order to get a hold of me. I also called her office and emailed her clinical assistant to explain the situation. Thankfully at 9:00pm, the surgeon called me. Turns out she didn’t even attempt to call earlier because she was still working. Phewf! We discussed the Jet Lag and the minor cold and she let me know that if my cold didn’t turn to a fever I would be good to go for Thursday. She let me know to contact her clinical assistant by 11am today to let them know how I was feeling and to give the final confirmation. I called my parents back to let them know what was going on as well as texted my boss. I then went directly to bed to try kick this cold. I woke up a few times during the night, mainly because I am still Jet Lagged but also I had a lot on my mind about what I had to do today to get prepared. This morning, I was feeling much much better so I emailed my surgeon back as well as her clinical assistant to confirm that I was good to go. Brandon made the appropriate phone calls to get himself lined up to be off of work for the next two weeks. I called my parents who then cancelled Easter plans as well as their plans for that day. We then called/texted/messaged all of our friends to let them know that I was going in for surgery tomorrow. Then we went out for my stomach’s final breakfast and dropped by my work’s head office to thank everyone for their support and to give updates. All was well and we were set to go! Mentally, I was super ready and looking forward to getting it all over with. As soon as we pulled into our driveway after our morning adventures, a phone call came from the clinical assistant. My surgery has been cancelled due to a staffing issue. They were sincerely sorry and I was put back on a waiting list with first refusal. I think I experienced more emotions over the following five minutes then I have this whole five months. Of course we were both disappointed. Then we were upset that I would have to wait again. Then angry that we just told everyone and made appropriate plans which were now not necessary. I was actually more upset about telling all my friends, co-workers, and family and now having to tell them that it was a false alarm. My cell phone was buzzing all morning with well wishes for a speedy recovery. This still bothers me but I am trying to get over it. Things like this happen and it was 100% out of my control so I shouldn’t blame myself. But I am still very sorry for freaking out my friends and family today as well as creating a lot of unnecessary work for my employer as well as Brandon’s employer. The funny thing is that Brandon and I are not good at being angry for a long time. In fact, we are not good at being angry at all. About 10 minutes after the phone call came, we gave each other hugs while saying, “We are SOOO angry” but we were smiling and laughing about at the same time. By 11am, we were back to our regular life. We took advantage of our day off and went to see the new Captain America movie as well as catch up with Game of Thrones. As the day progressed I was able to reflect on what had happened over the past 24 hours. Even though it is unfortunate that the surgery was cancelled, I am now able to fully get rid of this cold as well as regain the weight I lost in Japan. I was also able to see Captain America. I also get to participate in Easter festivities as well as eat copious amounts of Easter chocolate and Ham this weekend. 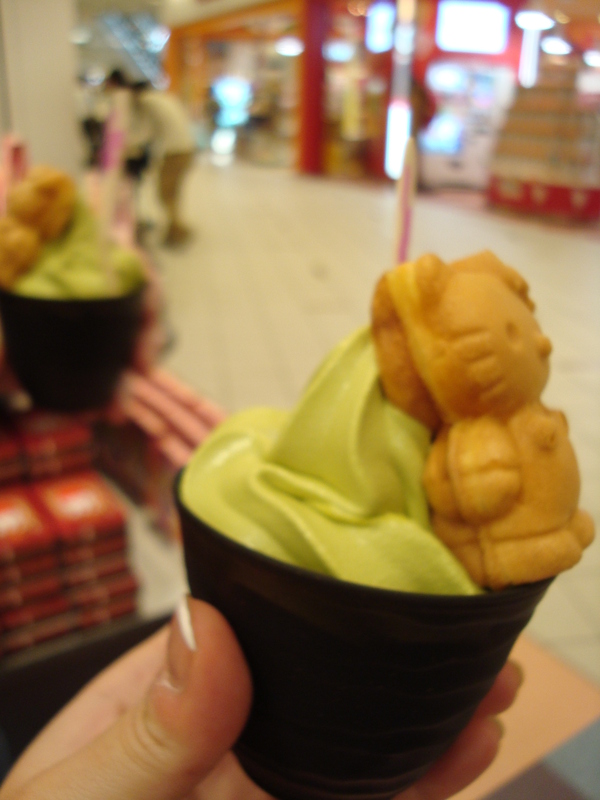 I might even get some time to blog about my Japan trip!! The stars didn’t align for me today, but everything happens for a reason and there was a reason why the surgery didn’t happen today. So I don’t have a surgery date anymore. I’m on high priority on the cancellation list. The office estimates that I will have the surgery within the next month or so. As much as this is unfortunate that I don’t have a date anymore, I am actually glad it is working out this way. Now, I won’t have as much time to stress about the surgery coming up as it will likely be last-minute. I’ve already been through it once and I was totally okay. Farewell stomach tour – Japan Edition – 4 weeks to go! On Saturday I returned from an adventurous trip to Japan. We were continuously on the move and managed to cover six different areas of Japan over fourteen days. I was hoping to write a blog last week for my weekly blog entry but obviously that didn’t happen. The days were jammed packed and by the time I was back to the hotel, we were asleep. I have thought a lot about how to do this blog entry because there is a lot to cover. 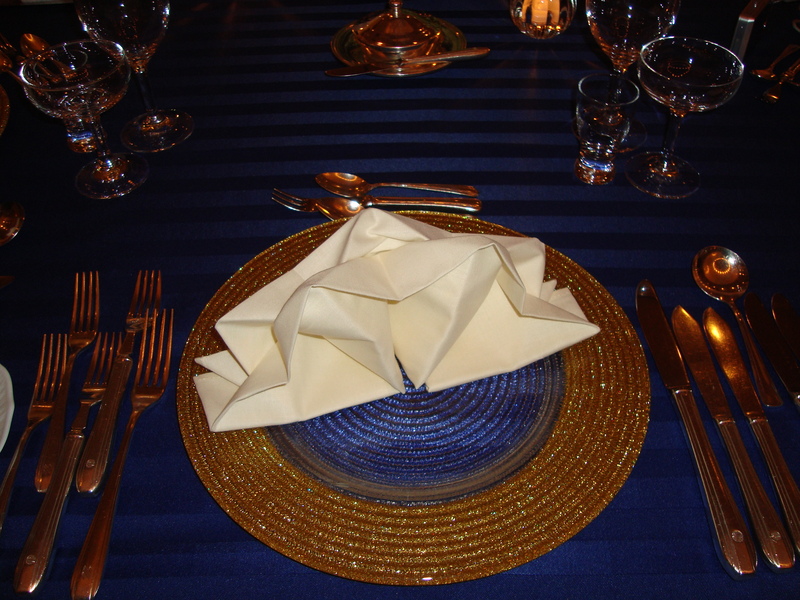 This being a blog about losing my stomach, I decided that I will focus on the dining experience. Unfortunately, this was probably the least memorable part of the trip but also the most adventurous. Before I left for the trip, I was really excited to eat tonnes of Japanese food while I was away and put on some more pounds. I now realize that this was not the most accurate assumption as majority of the Japanese people are thin. I only saw one obese person during the whole trip and that isn’t a lie. During the first few two days of the trip, I started to worry about what we were going to eat for the following week and a half. 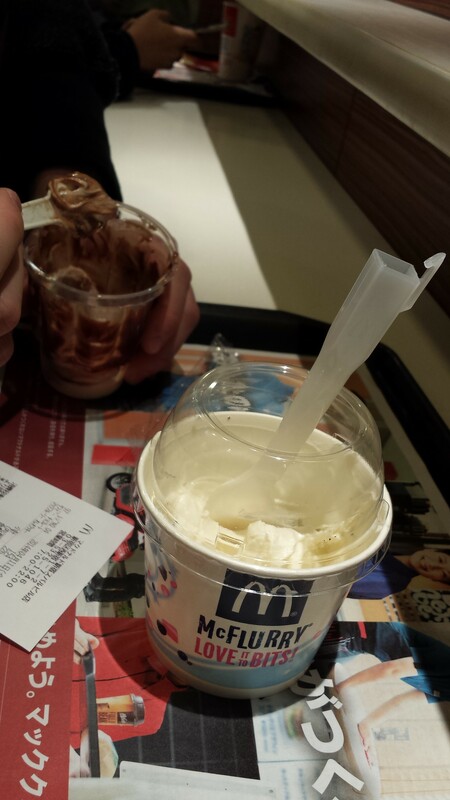 Due to the Jet Lag (13 hour time difference ahead), I did not have much of an appetite. That combined with the different cuisine, did not make a great combination. As the trip progressed, we all became better at finding foods that we enjoyed eating but to be completely honest, the beginning of the trip was rough. 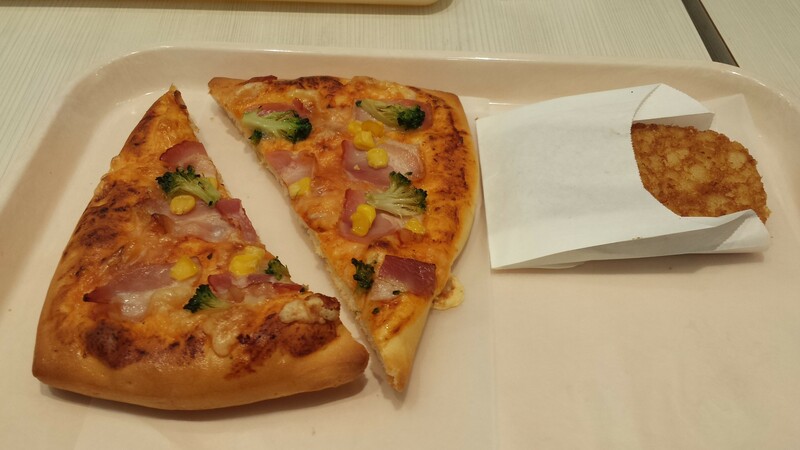 I realize that Japanese food here is NOT Japanese food. 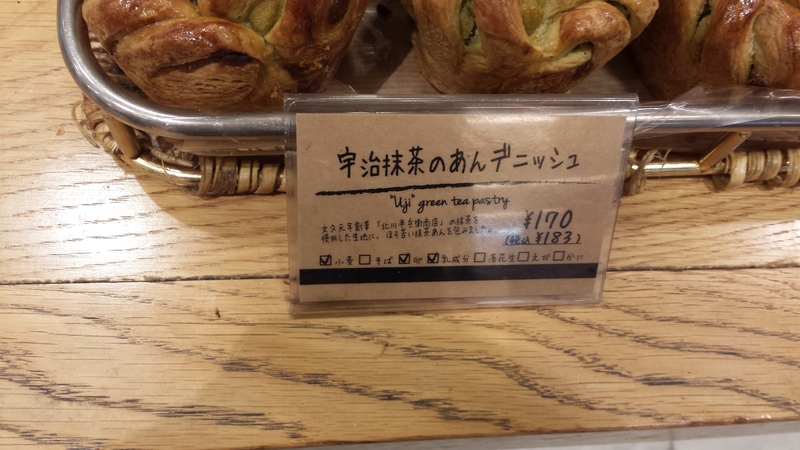 The flavouring in Japan is completely different than western flavouring. 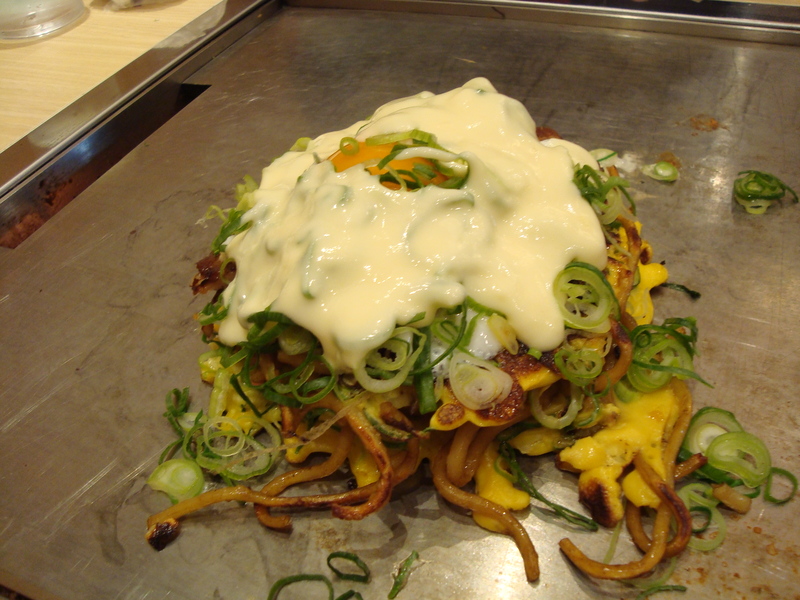 There is also this Japanese mayonnaise that is on about 70% of the food. I am not picky on foods but mayonnaise is something that I try to avoid as it often makes me feel ill. So this didn’t help, although near the end of the trip, I figured out how to say no mayonnaise which was helpful. Here are some pictures of what we were up against during the first few days. 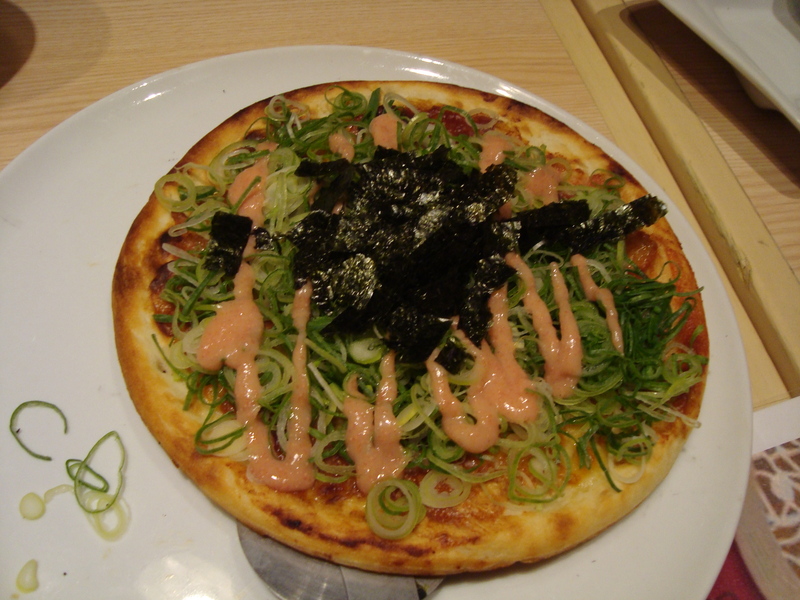 Japanese Pizza – Seaweed, Japanese Mayo, and green peppers or green onions? 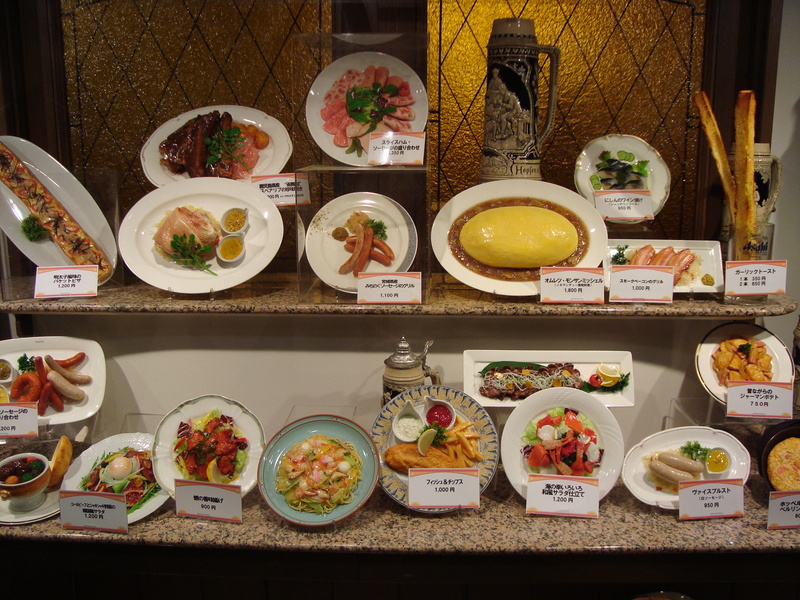 Also, majority of the Japanese restaurants display what they serve using plastic models of the food in the restaurant window. 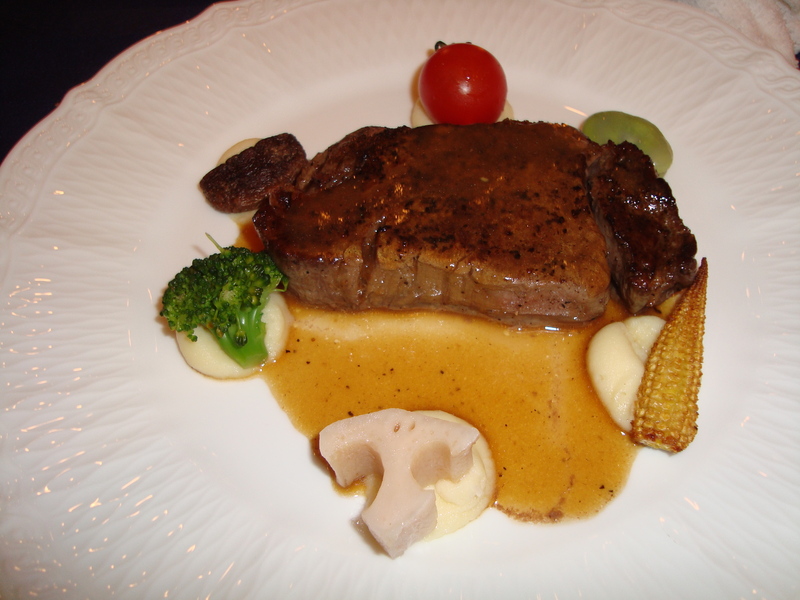 The models did not do the food any justice on our opinions. Finally, majority of the menus are not in English, so you are left to look at pictures and try to interpret what the restaurant has to offer. We all started to worry that we were going to starve in Japan. Haha. 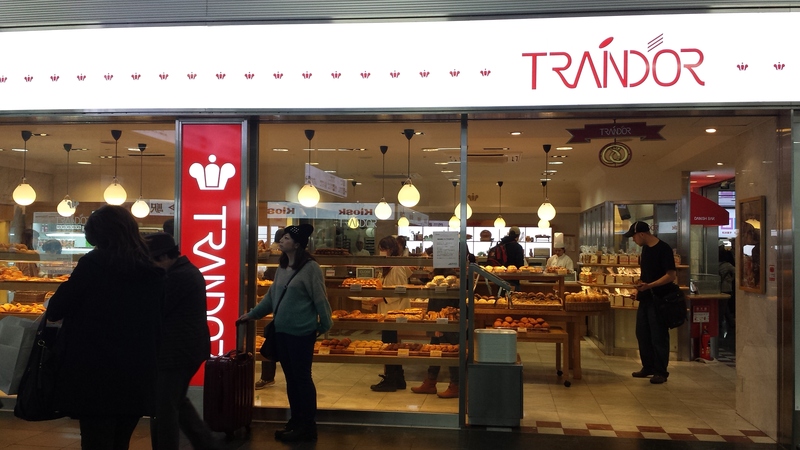 I believe the turning point came on the third day when we discovered that there are these bakeries located underground near all the train stations. 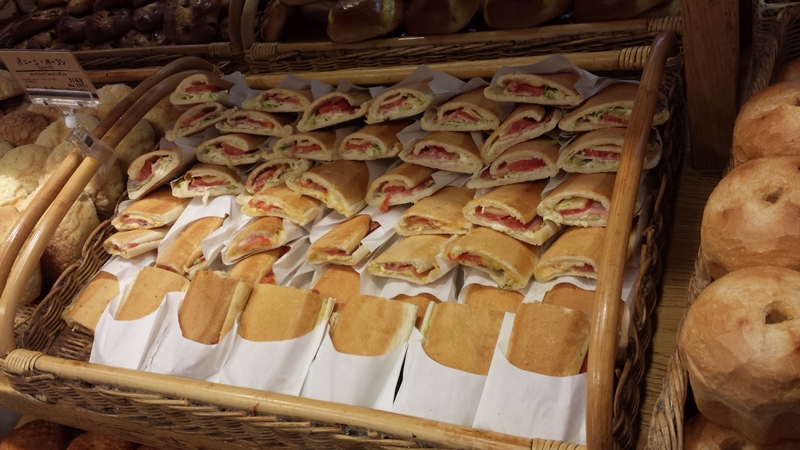 They were filled with fresh baked goods consisting of pastries filled with a variety of items. Some were sweet and some were savory. I could not have been more happy to find some food that was easy to find and easy on the stomach. This was also the day we discovered that there was a small grocery store below our hotel and it had some fresh produce (bananas, apples). 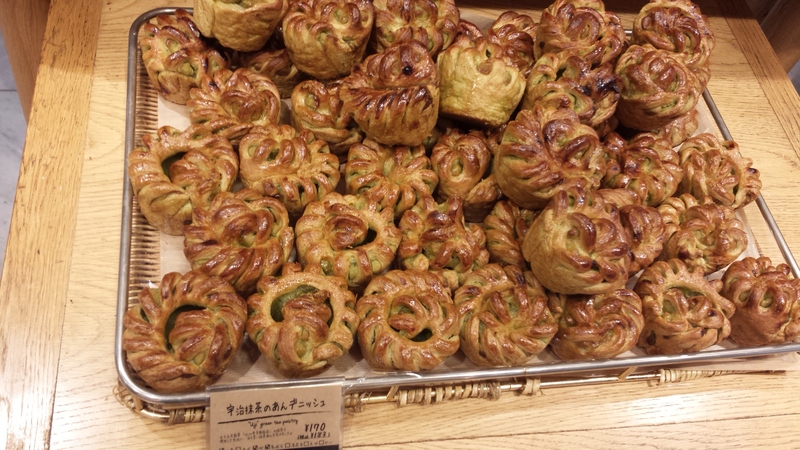 Here’s some pictures of some goods that I was able to pick up at various bakeries throughout the trip. The reason we went to Japan was for our friend’s wedding. The meal there was a combination of western and eastern food. It was a large meal and I knew we were up against something when I saw the place setting. 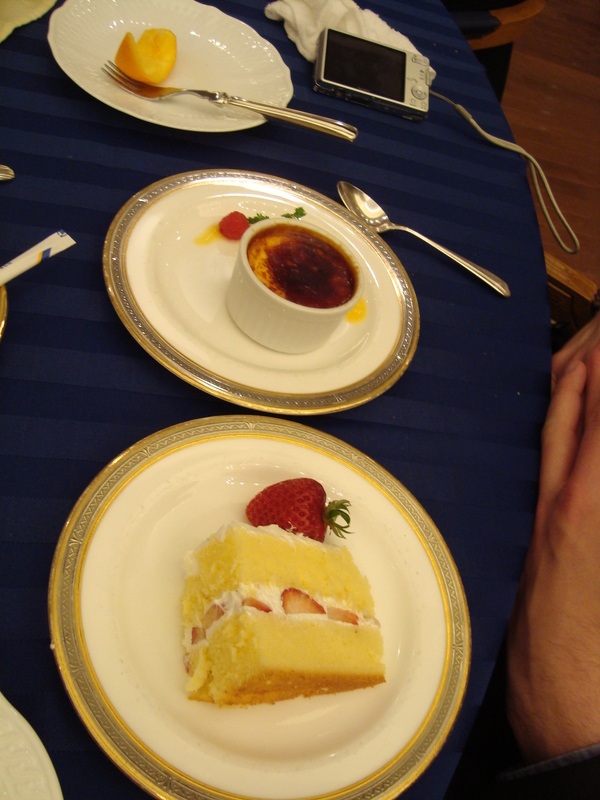 We had an eight course meal at the wedding and I was only able to eat about half of it. Because I had not been eating much during the first portion of the trip, my stomach size probably shrunk and I couldn’t consume as much. 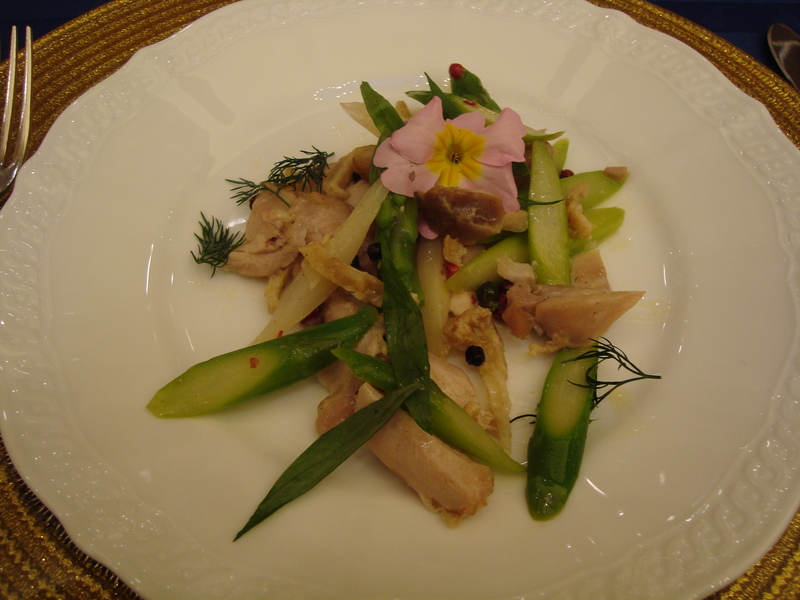 Here are some pictures of some of the courses. 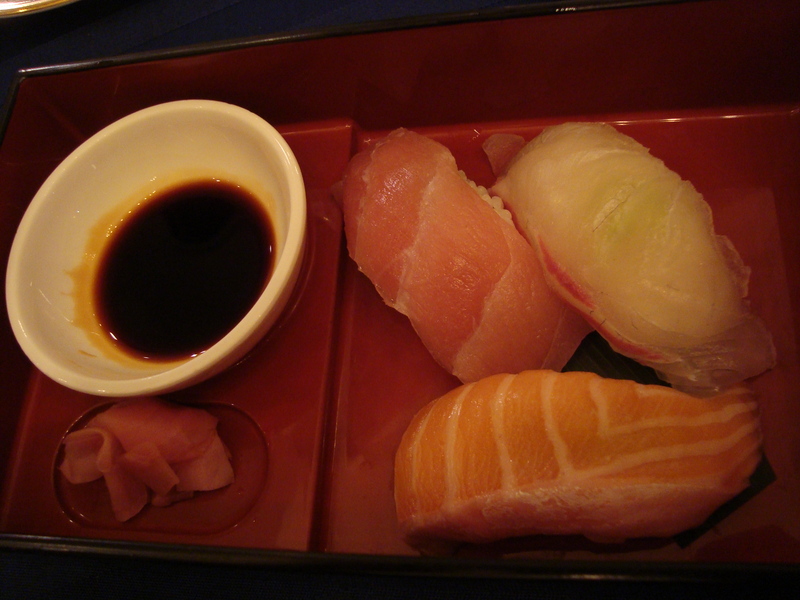 After eighth course – Sushi!! Prepared by the chef. If this wasn’t enough food. After the wedding we went to the second wedding party. 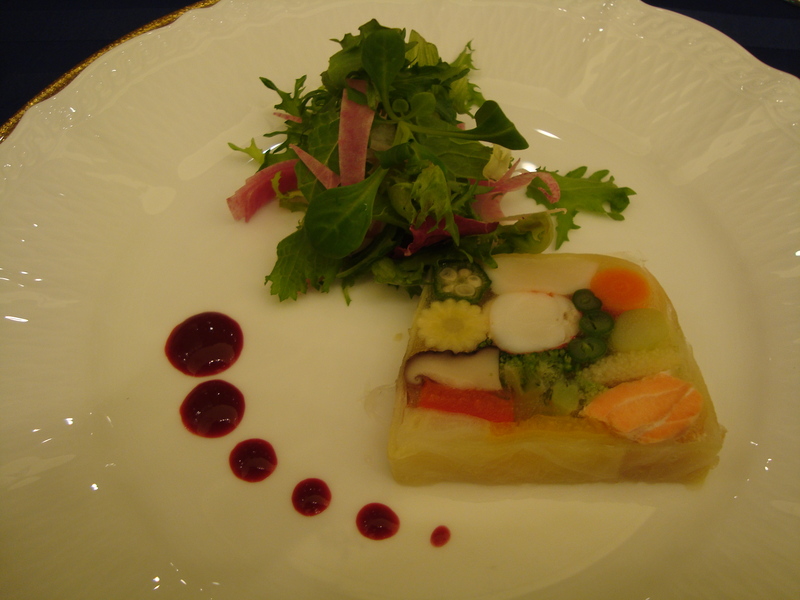 In Japan, the weddings end fairly early and there are after parties. At this party guess what – in case you were still hungry, more food! 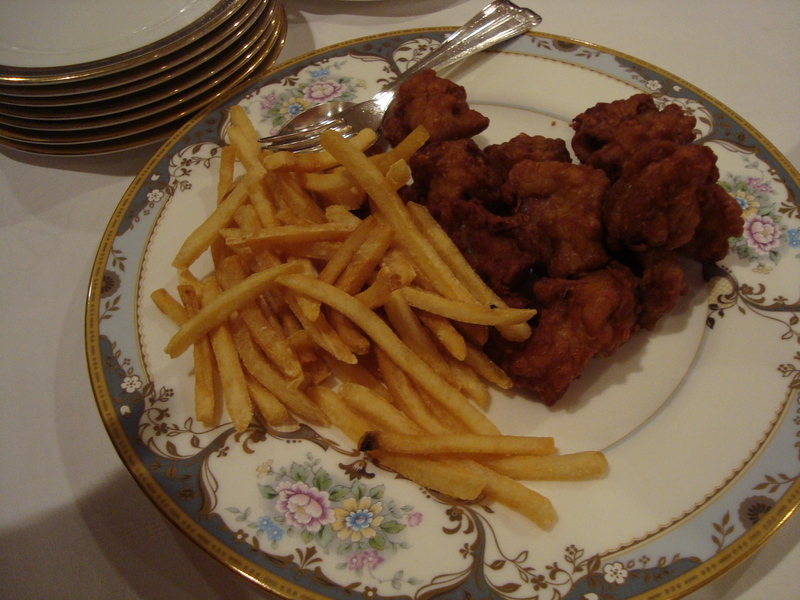 Chicken and fries. Which we were convinced were McDonald’s Fries. The day after the wedding. 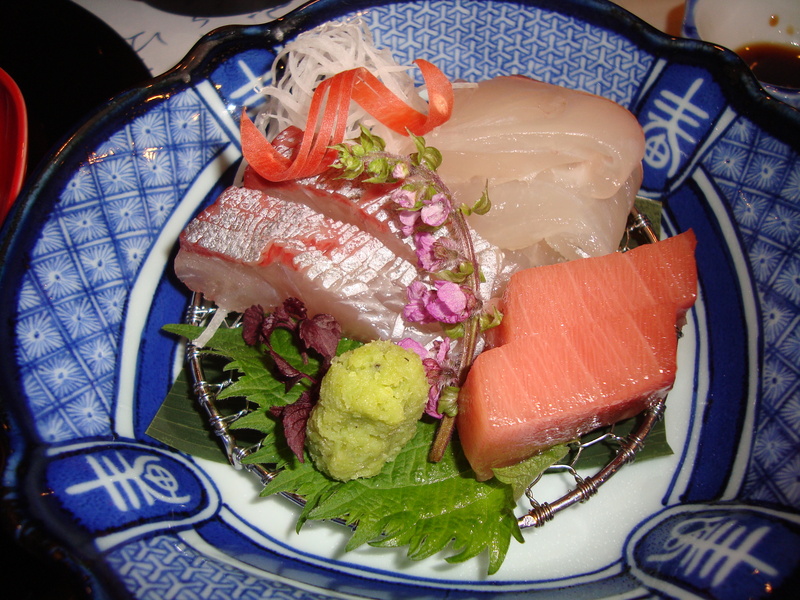 We were treated to a night at a traditional Japanese hotel – Ryokan. It was a hot springs resort and it was awesome. 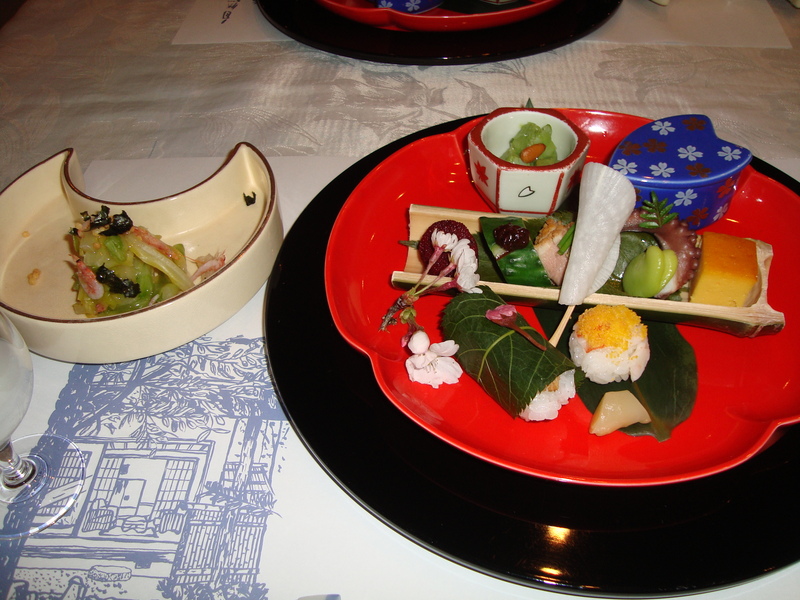 The dinner on the other hand was traditional Japanese food and a lot of it was a mystery to me. I didn’t feel as bad though because my friend’s new Japanese wife also did not know what some of it was. Not to mention it was a twelve course meal. I gave up after the third course and stopped taking pictures. 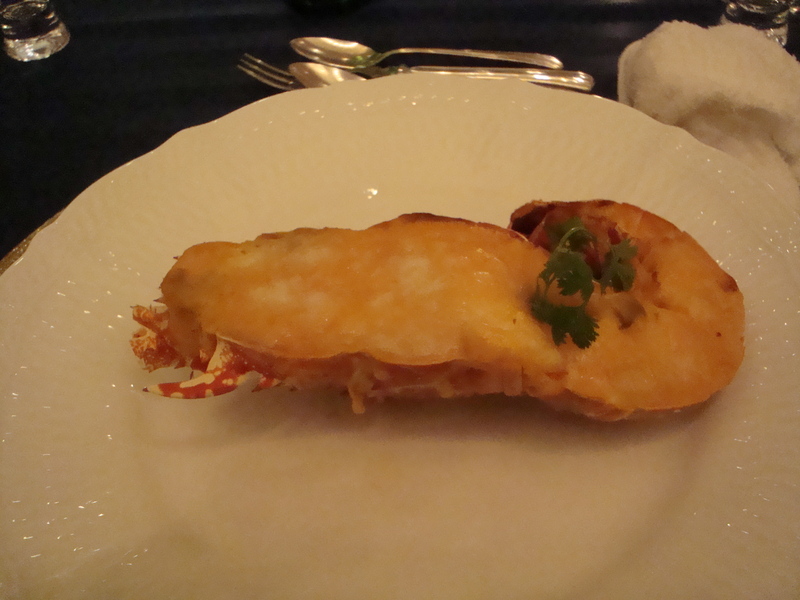 But here is a sample of what we were served. 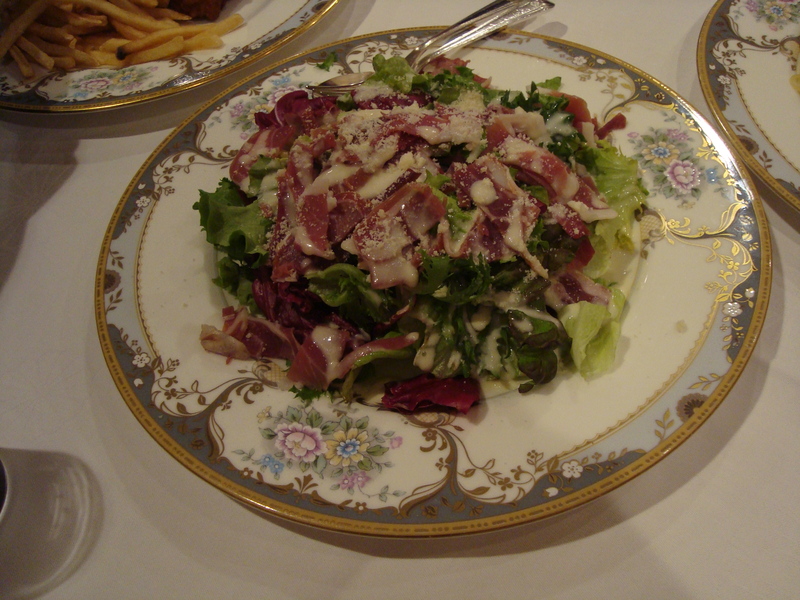 First Course – notice the baby shrimp on the salad. I couldn’t eat them because they were looking at me. But I ate everything else minus the octopus. Second course – I was excited for the sashimi but the first one I ate (top right corner) was so chewy it put me off of the rest of it. I felt bad wasting it. 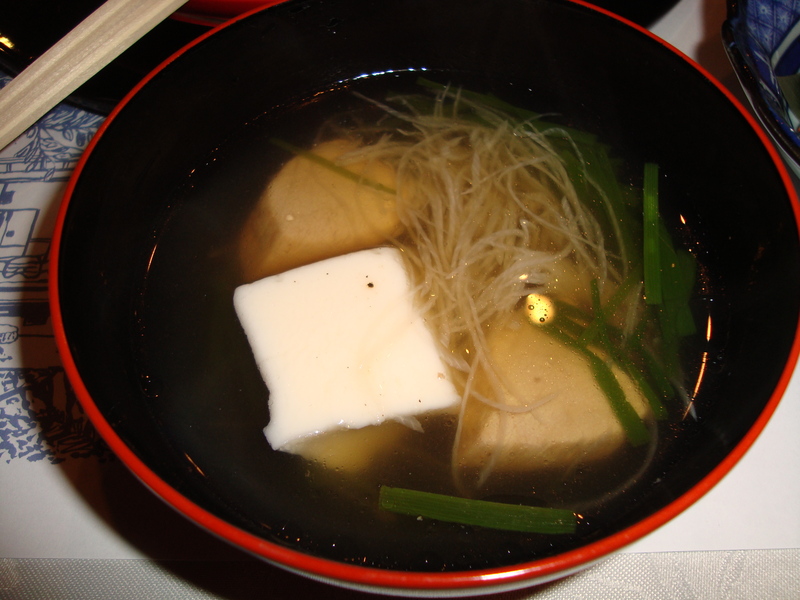 Third course – Miso soup. 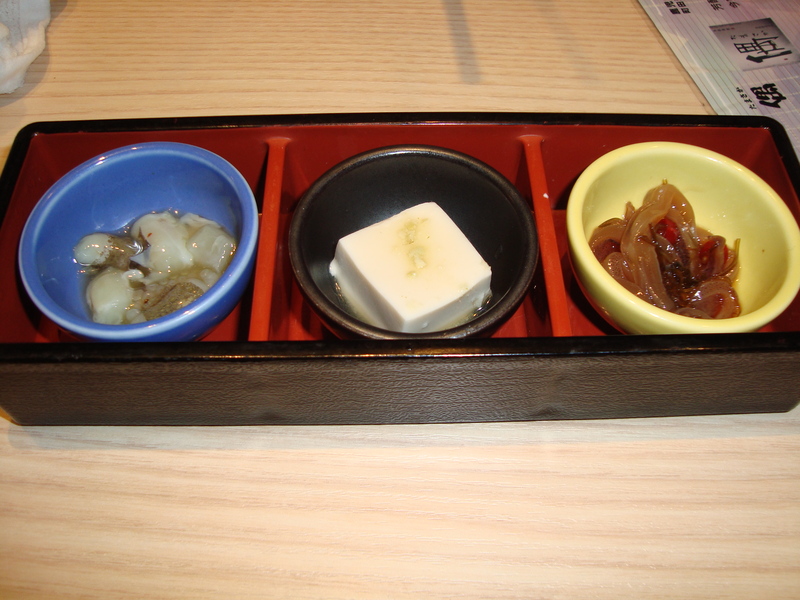 I really enjoy miso soup and ate most of this. Minus the tofu which my friend explained as as wet booger. 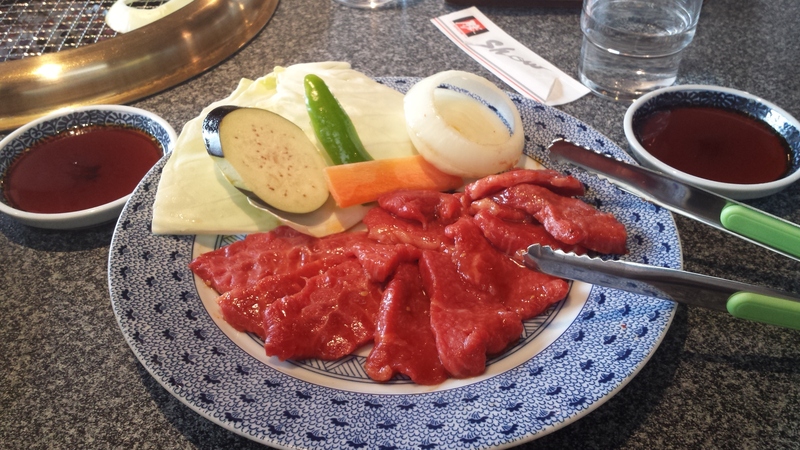 I think out of all the things we ate over the course of the trip, my favourite was the Yakiniku. 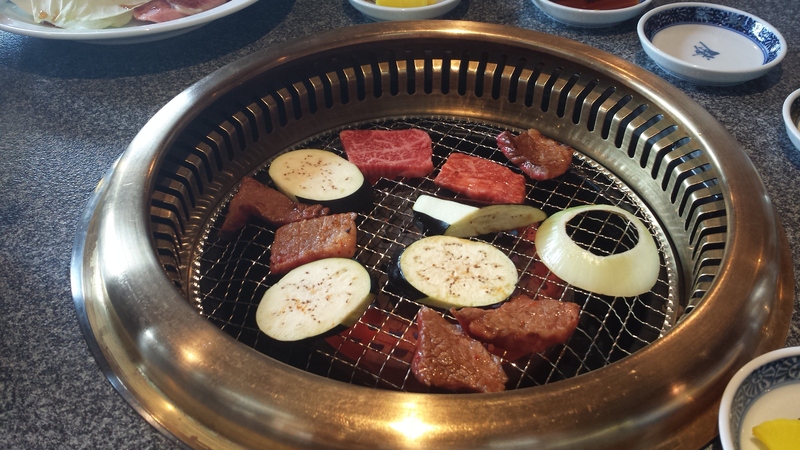 Basically, you order a plate of raw vegetables and meat and you grill it on your own personalized grill which is built into the table. 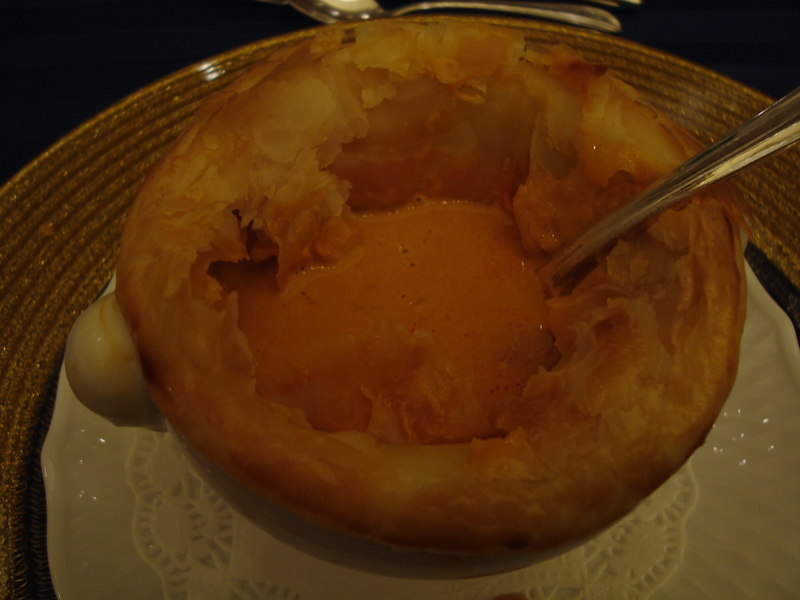 It was really tasty and filling. 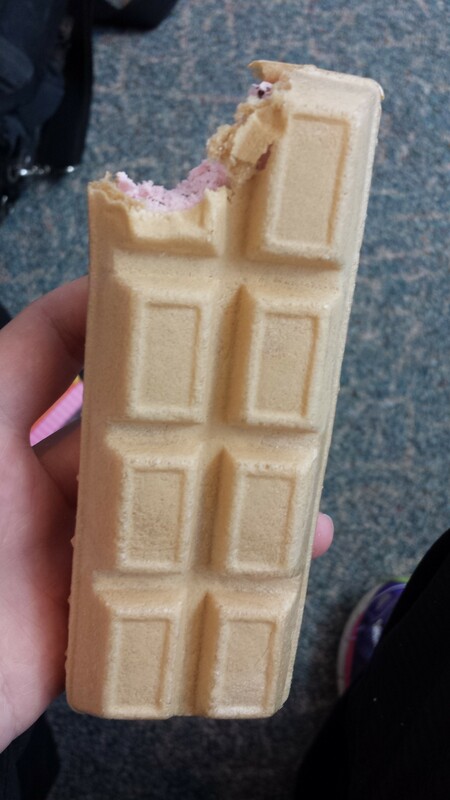 Finally, there is always room for ice cream. I definitely made up for some lost calories through frozen treats. 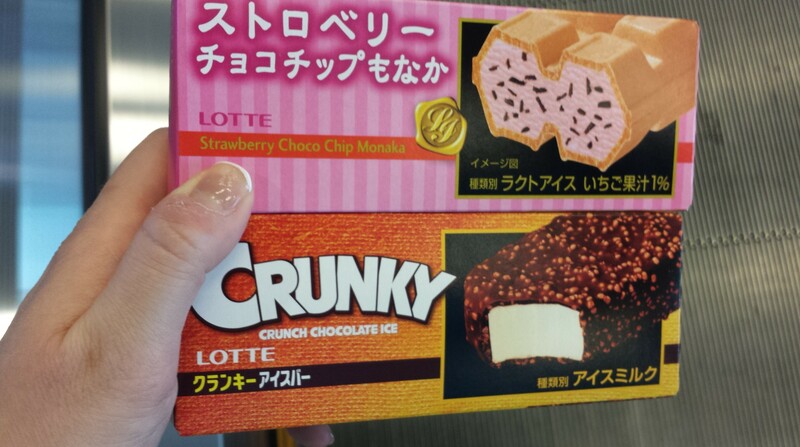 One thing I can’t forget to mention is the abundance of vending machines in Japan. The majority of them have beverages – hot and cold – in them. Some have ice cream and others cigarettes. They are everywhere and you can find them in the most remote places – like in the middle of the country on a non busy street. You can be sure that you will never go thirsty in Japan. 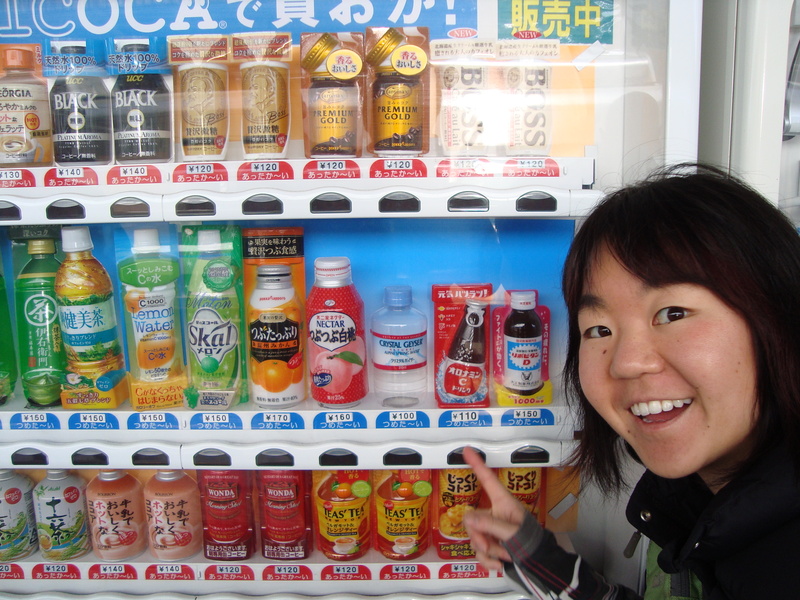 The beverages range from 110 yen to 150 yen ($1.10 – 1.70 CAD) depending on where the machine is located. Anyhow, that is just a small sampling of what we encountered in Japan. Once I get over this Jet Lag, I may make more posts about the actual trip which was amazing and wonderful. I would return in a heart beat. 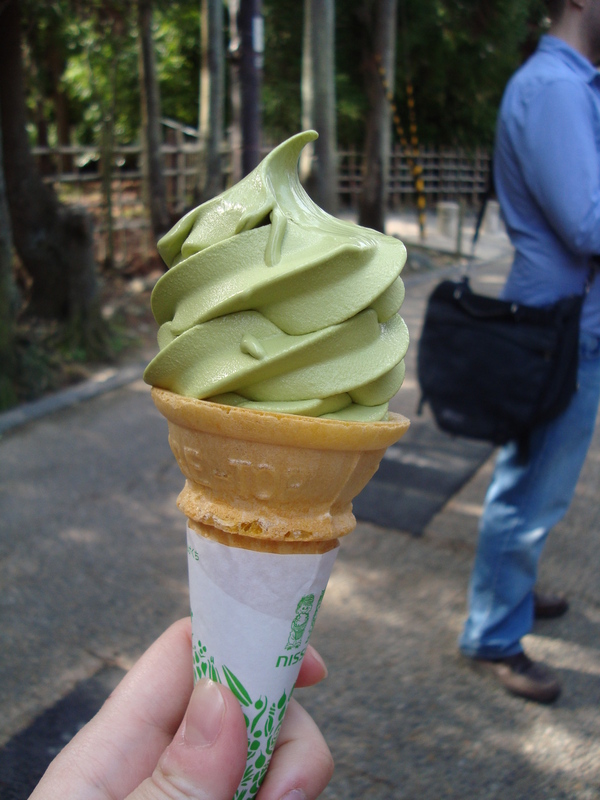 You could write a whole blog just based around Japan. I just want to re-iterate though, that the food in Japan was just a small portion of my trip and also the hardest part for me. I lost about 4 lbs during the trip so now it’s time to try put it back on. Yahoo! !